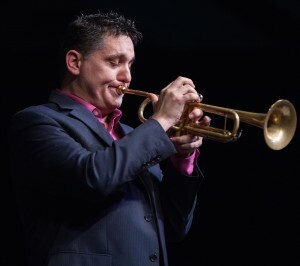 ​Renowned international trumpeter Rex Richardson is a Yamaha Performing Artist and a veteran of the acclaimed chamber group Rhythm & Brass, the Brass Band of Battle Creek, and jazz legend Joe Henderson's Quintet and Sextet. He teaches trumpet, jazz improvisation and chamber music at Virginia Commonwealth University and hold the title of International Tutor in Trumpet at the Royal Northern College of Music in England. He tours throughout the year as a clinician, recitalist, and soloist with orchestras, wind ensembles, big bands, and brass bands. Congratulations to members of Brass of the Potomac who placed in the solo and small ensemble competitions at NABBA 2016 in Fort Wayne, IN. ﻿2/3/2016 - Ticket Sales Have Begun for our March 20 Concert featuring Rex Richardson. 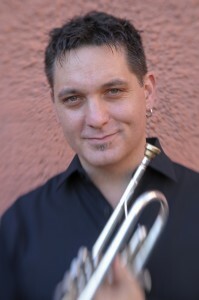 International trumpet superstar Rex Richardson will join Brass of the Potomac for a blockbuster concert including the DC-area premier of Anthony Plog's Concerto Number 3 for Trumpet and Brass Band as well as a preview of Brass of the Potomac's program for the 2016 North American Brass Band Championships. See the the events page for more details! Happy New Year to all of our friends in the local community and the brass world! 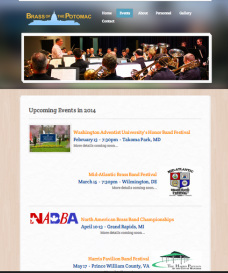 Brass of the Potomac is gearing up for an extremely busy Spring! We are working with Northern-Virginia native and international trumpet superstar, Rex Richardson, on a new commission for trumpet and brass band by composer Anthony Plog. We will be presenting the new work in concert on March 20, 2016 with Rex as the featured soloist. Brass of the Potomac will also be travelling to Fort Wayne, IN on April 1 and 2, 2016 to return to the North American Brass Band Championships. And there are more concerts, outreach, and recordings on the horizon! Brass of the Potomac's mission is to enrich, entertain, and educate the local community and beyond with the unique music of brass bands. But we can't do this without your support. It's the perfect time of year to help support the arts with a tax-deductible contribution. Your donation is vital in helping Brass of the Potomac flourish and will be recognized in our concert programs during the 2015-2016 season. Thanks to everyone who has supported the BOTP at home and from afar! Can't wait to see you at our next concert! Our performance of Edward Gregson's "Symphony In Two Movements" on Friday night was delayed until around 10:45pm, but the band handled the set back well and gave a great performance! 4barsrest.com said that our, "...deliberate intent was delivered in spades to close a performance of intellectual rigour and cultured musicality." Saturday's performance of our own choice piece, Peter Graham's "On Alderley Edge", was a great highlight for many of our bandsmen! Not only did it feature some amazing playing by our soloists on horn, soprano, cornet, and euphonium, but it also showcased the ensemble's musicality as a whole. Our musical director, Stephen Bulla, told 4barsrest.com, "We are very happy with the result. We continue to work hard and grow as a band despite many of the players having extensive military commitments. This is the best result at the event since our formation in 2008, so it shows how far we have come, especially with our performances of the test piece and 'On Alderley Edge'." Band members returned home Sunday evening thrilled from a great weekend of brass banding in Grand Rapids, Michigan! Friday morning ten BOTP members competed in the soloist competition held at the Amway Grand Plaza hotel. Glenn Sewell won the 1st place percussion solo award, and Beth Thomas won the 2nd place high brass lyrical solo award! After a busy and successful contest season, the BOTP will be playing two concerts this weekend on both sides of the beltway. Our program will feature a diverse range of music from British brass band standards to swinging movie music. We will also feature the virtuoso talents of our Solo Trombonist, Jay Gibble and our flashy cornetists, Beth Thomas and Jeffrey Northman. Please come out and enjoy our free concerts! Harris Pavilion Community Band Festival. -Sunday, May 18th @ 4pm. the band will perform at the Glenelg United Methodist Church in Glenelg, MD. The Brass of the Potomac is back in action this Sunday! Come out and here the band this Sunday (Oct 12) at the Knollwood Retirement Community in Washington, D.C. Check out our events page for more information. Check out our new "Events" page in the navigation bar, or click here to go there directly. Hope to see you in the audience soon!